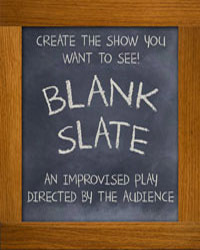 Blank Slate, the latest comedy extravaganza from Unexpected Productions, offers budding directors in the crowd the chance to shape an entire narrative play. You and your fellow audience members are asked to create everything from characters to setting to scenes. And if it isn’t working, the group can decide to switch things up in the middle as well. Anything goes in this sure-to-be hilarious show, with off-the-cuff content that can run from a Shakespeare-inspired romance to a Saturday Night Live-style satire, all in the same evening. Unexpected Productions’ resident narrative improv troupe, Improv Anonymous.